What Are The Best Toys For Newfoundland Dogs? Ah, Newfoundlands. These gentle giants are sweet, smart, and loyal—and if you’re lucky enough to be a proud parent of a Newfoundland, you want to do everything you can to make sure your pup stays healthy and happy. And a big part of keeping your Newfie happy? Making sure they’re engaged with plenty of play—and in order to do that, you need the right toys. But not all toys are created equal! The perfect toy for a Schnauzer, a Shih Tzu, or a Chihuahua likely isn’t going to be the right fit for a Newfoundland. So what are the best toys for Newfoundland dogs? What should you be on the lookout for? And what toys are a must to add to your collection to make sure your Newfoundland has plenty of playtime to keep them busy? When it comes to choosing the right toys for your Newfoundland—or for any breed, for that matter—you need to be strategic. The best toys are going to be the ones that play to your dog’s nature, keep them engaged, and provide the entertainment and exercise they need to stay happy and healthy. So what does that look like for Newfoundland dogs? What are the most important traits you need to consider when choosing the best toys for Newfoundland dogs? First things first—Newfoundlands are people dogs. They’re loyal and like to be around their humans as much as possible. 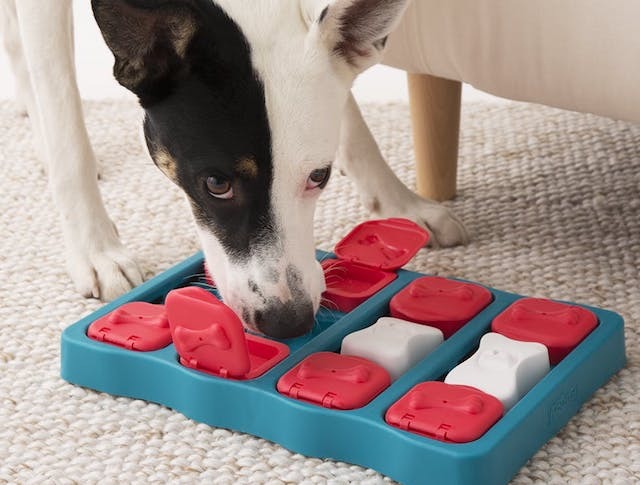 Finding toys that you can use with your dog (instead of toys your pup uses on their own) is a great way to keep them engaged. Newfoundlands are also extremely intelligent. Because they’re so smart, it’s important to find toys that keep your Newfoundland’s brain engaged (otherwise, they’ll use that intelligence to get into some serious mischief). In terms of activity level, Newfoundlands have a tendency to be a bit on the lazy side. They need a certain amount of exercise, but they’re also perfectly content just snuggling up at your feet. Toys that help them get exercise and stay active are a must (don’t worry—there will be plenty of time for snuggling after playtime!). Lastly—at the risk of clearly stating the obvious—Newfoundlands are BIG. Newfoundlands fall under the “giant breed” category and can get up to 150 lbs. That means any toy you give your pup needs to be big enough to a) withstand their giant chompers and b) not present a choking hazard. Alright, so now that you know what traits to consider when looking for toys for your Newfoundland, let’s get into the good stuff—the best toys for Newfoundland dogs. As mentioned, it’s important to find toys that will encourage your Newfoundland to get the exercise he needs to stay healthy. And Fetch Toys are the way to do it. Fetch toys are great for Newfoundlands because it gets them outside and active. But because you’re the one throwing the toy, fetch also has an interactive element—which your Newfoundland, being a people dog, will absolutely love. He’ll be having so much fun with his fetch toy, he’ll forget he’s exercising! If it’s too cold outside to play fetch, Tug Toys are another great interactive option for Newfoundlands. Tug toys offer the best of both worlds—your Newfoundland gets to spend time playing with his human (or another pup!) and you get to help your Newfoundland work off any excess energy. The final result? A happy, relaxed Newfoundland. Again, Newfoundlands are an incredible smart breed—and if you don’t want your pup to use his intelligence for mischief, you need to find toys that engage his brain. Thinker Toys are like puzzles for pups. Your Newfoundland will have to figure out how to maneuver the puzzle and get to the delicious toy in the center. All the problem solving will keep your Newfoundland engaged—and out of trouble! Remember when we said that Newfoundlands are big and strong, and therefore need strong toys to withstand their big chompers? Well, Super Chewer Dog Toys were designed specifically for this purpose in mind. From extremely durable nylon-based Benebone toys to the hard rubber variety, these dog toys are guaranteed to stick around for a long, long time. Now that you know the best toys for Newfoundland dogs, you want to make sure your pup has plenty of the right toys on hand. And the best way to keep your Newfoundland stocked in the perfect, super-durable toys? The Super Chewer BarkBox. With the Super Chewer BarkBox, you’ll get a carefully curated selection of 2 toys, 2 bags of treats, and 2 chews delivered to your door each month. And because each box is curated by size, you can rest assured that every toy, treat, and chew delivered will be the perfect size for your gentle giant! What Are Some Ways I Can Save Money On My Dog? What Are Some Creative Gift Basket Ideas For Dog Lovers?